Babamots 2 So difficult to see the good move your opponent will have in three turns. I love how the layout looks like nonsense to the uninitiated. BloodRumpus 2 Very simple rules, but very deep strategic gameplay. A masterpiece of game design IMO. bugggg 2 The learning curve is steep, but Homeworlds is a great game once you learn it! 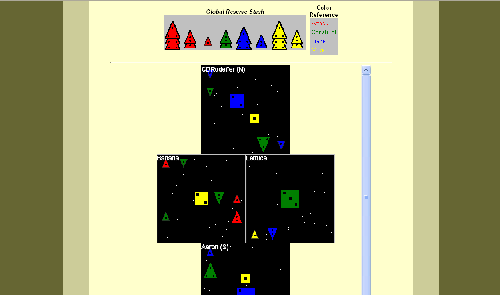 CDRodeffer 2 Good boardless space chess game! There are many interesting combinations for repeated building and exploration. It's a rich game as it is, but with so many different colors of pyramids available, it almost begs for home-brewed expansions. Cerulean 2 A game for the ages! Very replayable, mind-opening, resource management game with many innovative concepts. Homeworlds deserves to be taught alongside Chess. Draw5PlayAll 2 Changed from 1 to 2 after finishing 1 game and having a few more in-progress. Pure strategy is the way to go. dsheldon 2 A bit of a learning curve, but if you're looking for *THE* space-themed, chess-type game, this is it. Felix 2 Pretty easy to learn.... insanely hard to master. This is the chess of the future for sure. This is the game that convinced me to buy my own pyramids and start exploring pyramid games. kanzenryu 2 Enjoying this greatly, but there seems to be a different way for me to be crushed in every game! morganfitzp 2 This game is as close to absolute perfection as a game can be. Get yourself a set of Icehouse pieces and teach it to your friends. smilingra 2 Really enjoyable. The theme actually works quite well with this. There is just enough complexity to make for difficult decision making. It does take some time to catch on, but once you've made the leap, it's lots of fun! stoneaxe 2 What a great strategy game. It takes 3 or 4 games and some helpful instruction to get the hang of it, but there are a ton of options and outcomes! tudd 2 Have not played on SDG yet, but this is one of my favorite games ever to play with an icehouse set. wyons 2 oh yeah! This is a goodun! The rules are admirably concise- but a pain to get used to. However it is well worth the effort- after a few games I am still discovering completely new tactical manoeuvres. ZackStack 2 My favorite Icehouse game and what drew me to SDG. Will play anytime! Aaron 1 I'm not very good, but I really enjoy this game. Highly unique! Hedge_o_Matic 1 I like this game, right up until I lose. For whatever reason, I can't seem to do any good with this one. Needs more plays! invisiblejon 1 Diplomacy and resource management. Passive aggression and outright aggression. A good game once you grasp the depths of it. Keith 1 A very clever use of color and pip count to drive the game. All colors are not equal and certain tactics tend to channel what first appears to be wide open options. Laurie_Menke 1 If I were more into brain-burner type games, this one would be my favorite. molnar 1 Have a lot to figure out here; should play in meatlife. nycavri 1 Fascinating game with surprisingly strong theme. Looking forward to honing my skills a great deal here. Very steep learning curve (and expert opposition at SDG!) is the only knock. Another game I prefer playing face-to-face. Personman 1 I would rank this among the 'perfect' games - innovative, deep, fun, no discernible flaws - but it has a frustratingly steep learning curve. unic 1 Extremely clever design... yet fails to engage me. bigby -1 I'm trying to figure this game out, but the learning curve is so steep. Nice concept, though. cdiffell -2 I didn't get this at all. The theme is strong enough to be an annoyance that it does not make sense. This feels disjointed somehow; like parts thrown together into an unsatisfying whole. neilb -2 Having a hard time seeing why this is so highly rated at the moment. Maybe it takes multiple games to "get it", but thus far I'm not tempted to play it again any time soon.